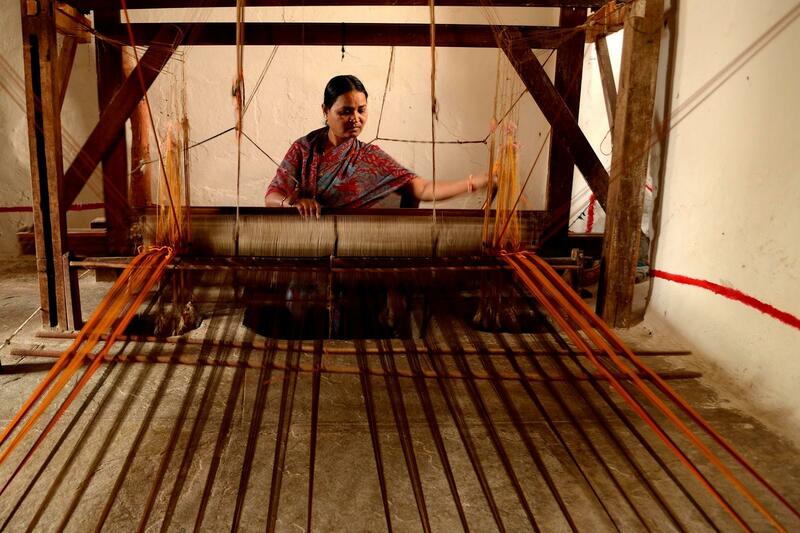 “Handloom Textiles constitute a timeless facet of the rich cultural Heritage of India. As an economic activity, the handloom sector occupies a place second only to agriculture in providing livelihood to the people. It is estimated that handloom industry provides employment to 65 lakh workforce directly and indirectly and there are about 35 lakh looms spread all over India”. This is what one comes across when they go to the site http://www.handloommark.gov.in/. Yet, the current climate begs to differ. One can easily find how the imposition of the Goods and Services Tax (GST) on the handloom sector has only crippled and choked the producers; even with the knowledge at hand. The new rules states that all the input materials used in the handloom production including the finished product is levied a tax of 5-18% which is a definitely not a bed of roses for the producers. Chockalingam Muthiah, one of the key mentors of the Gram Seva Sangh is also deeply puzzled as to why the government would do it as the “revenue expected from taxing handlooms is only a couple of thousand crores”. He asserts that handloom is an integral part of the “hand-making” tradition of India in which over 60% of the population is engaged. So other than the massive employment value, according to him, it also contributes immensely to the ecology as it is slow, self-limiting on resources and negligible emissions/effluents. I ask him if handloom has a personal/human value. “Violent ways of production, including chemical agriculture instils violence in human beings. Benign ways, quite naturally contribute to amity and gregarious living in human beings”. The Gram Seva Sangh wove the tax denial Satyagraha as a means of withdrawing the GST on all handmade products. This is a movement that has not tipped the scales in the producers’ favour. He moved on to explain how the organization took up the cause to fight for zero GST as the Satyagraha definitely increased dialogue and awareness. They petitioned the GST council in July 2017 and had state wide protests which was only intensified with a weeklong padayatra through the villages from Tumkur to Arsikere. Tayavva, a play was set up to portray the plight of the producers and they did something interesting with the tickets. “They were priced just over the GST threshold in defiance of payment of GST”, said Muthiah. It was when Prasanna Heggodu fasted for 6 days that the Karnataka State Government stepped in which resulted in the GST council appointing a committee. And subsequently in December 2017, they announced relief for 29 handmade items. And Muthiah emphatically pauses to say the next sentence. “BUT, it remains on paper”. The GST imposition would affect the consumers if weavers are “shunted” out, says Muthiah. The supply and demand would considerably go down. I ask him if he remembers any one incident that he had heard/seen who was in a financial struggle because of this. He can’t pick out any one. He says that all weavers are struggling, particularly because handloom is the “heart of North Karnataka”. Will the government exempt the taxes, I ask. And Muthiah is firm in his response, which exemplified his cause. “They will have to. We don’t think they have a choice here”. Prasanna Heggodu, another prominent face in this movement, founded the Charaka and DESI to promote rural groups who couldn’t find markets for their products. In his quote to livemint, “Some years back, the government tried to change the definition of handloom and club it with power-loom…In today’s world, with energy and fuel sources being depleted, there is a need to invest in sustainable products”. India’s biggest ever tax reform has choked livelihoods with an overbearing attitude of not being inclusive. Although now the charkha (used to spin khadi) on the Indian flag represents the Ashoka chakra, the fact still remains. That there is (or was) a charkha on the flag that ideally must present a situation where the lives of these workers are not neglected. Like Arundhati Roy poignantly puts it in her infamous essay, The Greater Common Good, “There is a hole in the flag that needs mending”. GST trouble on the handloom industry – very well explained …!! !